Barbour, Scott. Should Marijuana Be Legalized? San Diego, CA: ReferencePoint, 2011. 2011. Web. 1 Dec. 2015. <https://reader.follettshelf.com/mobileReader/indexMin.html#/sessionToken/tSuOi2Cjv1vXvQApIHEEPHTU/ktsId/209316/isAudioBookParam/false?page=2>. 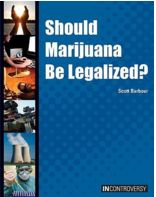 Scott Barbour is the author of " Should Marijuana Be Legalized?". This book was originally published on April 1, 2015. He received a bachelor's degree in English and a master's degree in social work from San Diego State University. He has written and edited numerous books on social, historical and mental health topics. Scott Barbour’s purpose is to inform. This book is in relevance to my topic because it gives me information on both sides of why and why not marijuana should be legalized. Sheff, Dave. "Marijuana Should Be Legal, But..." Time. Time, 4 Aug. 2014. Web. 01 Dec. 2015. <http://time.com/3079707/marijuana-legalization-teens-health/>. This article is trustworthy because it is from “Time Magazine”, and was written by David Sheff whom is an author. His latest book is Clean: Overcoming Addiction and Ending America’s Greatest Tragedy, the follow-up to his New York Times No. 1 best seller, Beautiful Boy: A Father’s Journey Through His Son’s Addiction. Sheff's purpose is to persuade, but since my purpose is to inform I'm using his article to inform about why or why not marijuana should be legalized. This article was published on August 4, 2014. "Legalization of Marijuana." Gale Student Resources in Context. Detroit: Gale, 2012. N. pag. Student Resources in Context. Web. 1 Dec. 2015. <http://ic.galegroup.com/ic/suic/PageFinderPortletPage/PageFinderPortletWindow?javax.portlet.action=doSearch&action=1&avoidSearchHistory=true&query=RN EJ2181500274&prodId=SUIC&p=SUIC&u=j246909003&p=SUIC>. Slambrouck, Paul Van. "The Debate over the Legalization of Marijuana: An Overview." Marijuana. Ed. Joseph Tardiff. Detroit: Greenhaven, 2008. Contemporary Issues Companion. Rpt. of "Pot Advocates Push Legalization." Christian Science Monitor 19 Aug. 1999: n. pag. Opposing Viewpoints in Context. Web. 1 Dec. 2015. <http://ic.galegroup.com/ic/ovic/PageFinderPortletPage/PageFinderPortletWindow?javax.portlet.action=doSearch&action=1&avoidSearchHistory=true&query=RN EJ3010202207&prodId=OVIC&p=OVIC&u=j246909003&p=OVIC>. This article is trustworthy because, It was written by Paul Van Slambrouck, whom is served as editor of The Christian Science Monitor from 2001-2005 and has held a variety of writing, editing, and management positions in the field of journalism. At the Monitor, he was a national and foreign correspondent, as well Foreign Editor, working in both print and radio. He now works in the department of Mass Communication. The article was published on August 19, 1999. "Paul Van Slambrouck | Principia College." Paul Van Slambrouck | Principia College. N.p., n.d. Web. 02 Dec. 2015. <http://www.principiacollege.edu/faculty/van-slambrouck-p>.